Home > Ask Our Experts > The Gap in My Teeth Reappeared: What Can I Do? Ten years ago I finished orthodontic treatment with straight teeth. The gap in my front teeth quickly reappeared so wire was cemented behind them to hold them together and I was told to wear the retainer once a week still. Over the last two years, the other teeth have started to space and turn. Is something like lumineers sensible - what would happen if they moved further? Some dentists suggest invisalign but if I straighten the teeth again, surely it may only last a few years again before I am in the same situation as now? Please advise me as to what might be appropriate (even if it is expensive) action? It can be frustrating to go through the process of having braces on your teeth, experience a lovely smile with straight teeth for some time afterwards, and then find your gap is reappearing. For some people with gaps between their teeth, it can feel like a never ending battle to maintain a pretty, straight smile. Invisalign is an attractive option primarily because it is discreet and subtle – rather than have to wear noticeable, metal braces, Invisalign is clear and less interfering on your 'look' and smile while you undergo treatment. 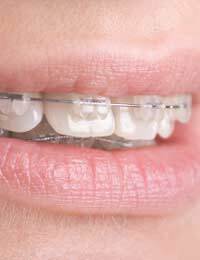 It is a more expensive option but if you're willing to spend the money and provided your orthodontist feels it may work, it's one option. As you said though, your teeth may still shift again. You should ensure that you are not grinding your teeth, especially at night, or that there are no other oral habits, which may be causing a long-term shift in your teeth. One thing I did wonder is whether your orthodontist performed a minor procedure to remove the frenum. This is somewhat of a web-like flap of tissue that is located between your top (front) lip and your upper (front) teeth. It grows to varying thicknesses, depending on the person, but in those where it is particularly dense or tough, it can actually pull your front teeth apart. If you never received this procedure, it can quickly, simply and painlessly be performed as an in-office dental procedure. This may be the key to keeping your gap closed for good! Finally, if all else fails, it might be more feasible to have a cosmetic dental procedure such as Lumineers, which will restore your entire smile. However, this is by far the most costly option and it will require extensive maintenance because Lumineers do not last a lifetime. The best thing to do is to speak to a highly qualified orthodontist about each option for correcting your gaps and he or she will work with you to find the best solution to not only give you a straight, healthy smile but keep it for years to come!